The Resilience, Adaptation Pathways and Transformation Assessment (RAPTA) framework is an approach to embed resilience concepts in development projects so they can better achieve their goals, and deliver durable outcomes in the face of socio-economic uncertainty and rapid environmental change. 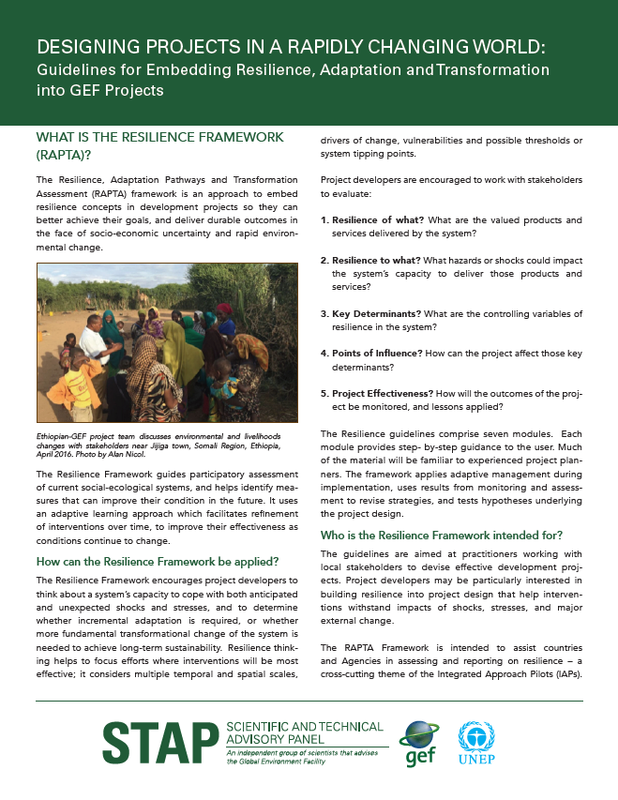 The Resilience Framework guides participatory assessment of current social-ecological systems, and helps identify measures that can improve their condition in the future. It uses an adaptive learning approach which facilitates refi nement of interventions over time, to improve their effectiveness as conditions continue to change. How can the Resilience Framework be applied? 1. Resilience of what? What are the valued products and services delivered by the system? 2. Resilience to what? What hazards or shocks could impact the system’s capacity to deliver those products and services? 3. Key Determinants? What are the controlling variables of resilience in the system? 4. Points of Infl uence? How can the project affect those key determinants? 5. Project Effectiveness? How will the outcomes of the project be monitored, and lessons applied? The Resilience guidelines comprise seven modules. Each module provides step- by-step guidance to the user. Much of the material will be familiar to experienced project planners. The framework applies adaptive management during implementation, uses results from monitoring and assessment to revise strategies, and tests hypotheses underlying the project design.